Quantitative light-induced fluorescence uses software to visualize and calculate the amount of calculus in small animal patients. Quantitative light-induced fluorescence (QLF) has been demonstrated as an accurate method for detecting dental plaque in dogs and cats. More recently, investigators revealed that QLF also quantifies dental calculus in dogs by fluorescing a bacterial component (porphyrin) using long-wave ultraviolet light. Their findings were presented in Journal of Veterinary Dentistry. Miniature schnauzers age 1 to 8 years were enrolled in the study comparing dental calculus in dogs fed dry diets with and without the addition of daily dental chews. The study began with a full-mouth scale and polish, followed by 7 days of daily tooth brushing and 28 days without tooth brushing. All dogs received the same commercial dry diet, and half also received a daily dental chew. Then, the study was repeated by swapping the treatment groups. What's Hiding in the Gums of Dogs and Humans? At the end of each study phase, dental calculus was quantified under general anesthesia. 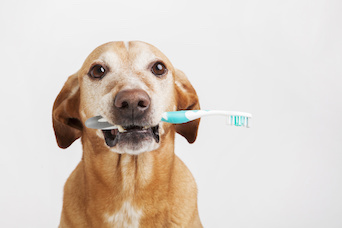 After removing plaque with a toothbrush, calculus was first scored using the Warrick-Gorrel method, which used a periodontal probe to measure calculus coverage and thickness on 18 teeth per dog. Categorical scores for calculus coverage and thickness were then used to calculate calculus quantity. The investigators used a QLF system (QLF-D Biluminator 2) to obtain images of the same 18 teeth. Inspektor-Pro QA2 software measured the area of calculus, indicated by red fluorescence, in relation to total tooth area. These values were used to estimate the percentage of each tooth that was covered with calculus, as well as a weighted calculus value for the entire mouth accounting for variable tooth size. A total of 306 teeth from 17 dogs were examined during the 2 study phases. The Warrick-Gorrel method showed that the addition of a daily dental chew to the commercial dry diet resulted in a 44% reduction in dental calculus. Similarly, QLF results showed that the average amount of dental calculus per tooth was significantly lower for dogs given a daily dental chew compared with those that did not receive a chew (9% vs 26%), resulting in a 66% average reduction in dental calculus on each tooth when a chew was provided. Whole-mouth calculus values correlated strongly with average tooth values. The authors hypothesized that the QLF method revealed greater reductions in dental calculus because it measured calculus on a continuous scale, contrasting with the older Warrick-Gorrel method’s categorical scoring system. Additionally, retrospective sample size analysis revealed that QLF was capable of detecting significant reductions in dental calculus using a smaller sample size compared with the Warrick-Gorrel method. The authors declared QLF an exciting and effective new method for quantifying dental calculus in dogs. QLF demonstrated higher sensitivity and statistical power with fewer dogs compared with the Warrick-Gorrel method, potentially allowing future dental studies to reduce animal use. Finally, the software-based method eliminated subjectivity by replacing human-based measurement of calculus with software-generated values.